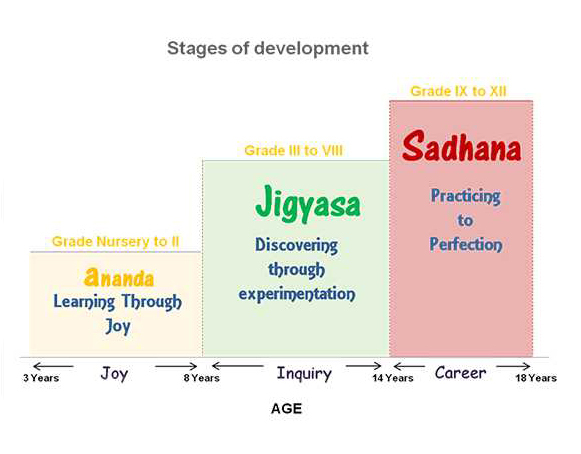 At IWS the pre-primary sections are called the Ananda phase. During the Ananda phase our teachers pay a lot of attention to ensure that children fall in love with the school environment. At IWS Children learn in an environment where each child is respected for the way and pace at which she or he learns. When children do not fear the school or their teachers, they feel free to ask questions and are not afraid to make mistakes. This creates the spirit of inquiry (Jigyasa) in them, which makes them confident learners who truly understand what they learn. Our assessment systems are designed to test understanding and not reproduce facts. IWS believes in making our children ready to face the world through scientific career guidance and stringent test preparation from Grade IX onwards. This is called the Sadhana phase, which focuses on disciplined effort towards a goal.